Despite throwing the audience a major curveball, the latest episode of Arrow gave off a well-worn feeling that works for furniture, but is generally a negative which it comes to TV shows. 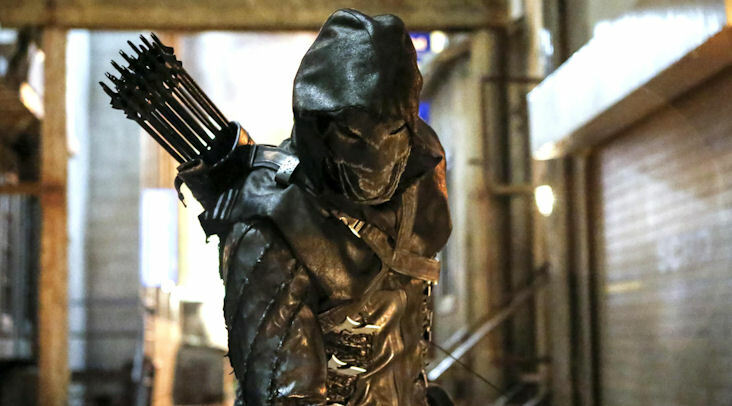 Throughout its run, Arrow has possessed a hot and cold relationship with comics cannon. It pretty much raided the Batman rogues gallery for villains in its early going in an effort to establish a universe of its own. It swung the other direction later by temporarily killing off a well-liked hero (Sara) to make room for Laurel to fill her comics canon role as Black Canary. Lately, the show has been more slavish to comics canon than not, so when new DA Adrian Chase and Vigilante showed up on the scene, it was assumed that the characters were one and the same, just like in the comics. So, it was quite a shock when Vigilante and Prometheus had a big battle on the rooftops this week, and Prometheus got the upper hand, and it was revealed to be Chase under the mask. After being missing in action so long, seeing Prometheus on screen was shocking enough, but the ultimate misdirection is worthy of a few golf claps. While I’m not exactly sold that this is the last twist we’ll see regarding Prometheus’ identity, it is good to know the Arrow writers are still willing to go out on a limb and defy what the comics dictate. The downside, of course, is that we’ve been down this road before. Chase has become a key piece of Mayor Ollie’s inner circle, which means a betrayal from within is inevitable and that’s not the first time this season that has happened (Evelyn Sharp and to a lesser degree Reporter Susan). The Prometheus twist wasn’t the only piece of this episode that contained all-too familiar beats that dragged the episode down. By the end, the Green Arrow, like the Hood and the Arrow before him, is officially an enemy of Star City, wanted for the murder of Felicity’s cop boyfriend. Thea goes back to her “Eat, Pray, Love” exile (and has been essentially written off the show) to find herself again, after realizing her willingness to blackmail a council member with buried details of a personal tragedy in order to save Ollie’s job was a little over the top, even for the daughter of Moira Queen. Like many of the recent episodes of Arrow, “Fighting Fire With Fire” was equal parts exhilarating and aggravating. The through line with Curtis excitedly inventing Mr. Terrific’s signature T Spheres (or as Wild Dog puts it: his balls), only to have the rug pulled out from under him when Paul hands him divorce papers, was good character work. Seeing Felicity drawn closer to a flame she can’t handle in the guise of Pandora and the Helix hackers is entertaining, and an interesting direction for one of the core characters. That is counterbalanced by the fact that Thea, returning for a couple of episodes after a long absence, is going back into exile seemingly to make room for more Susan. Speaking of Ollie’s squeeze, Felicity, whose boyfriend was killed by Ollie, hacks Susan back into her paper’s good graces to get her job back at Ollie’s behest (“I know I killed your lover, but you need to get me back with my girlfriend, you owe me”). She does get her job back, despite the fact Susan’s committing a termination worthy act by sleeping with the mayor while covering city hall, and covering up a huge story about the mayor being a vigilante wanted for cop murder in his spare time. New Canary hasn’t even escaped plot holes, because she’s been barely been on the Star City PD long enough to learn how to fill out the paperwork correctly, and she’s already a detective and on the mayor’s security detail. That has to raise eyebrows within the department at least, right? I’ll also mention for a final time there was a huge gun battle in the middle of the episode, as well. With Susan now in Chase/Prometheus’ clutches, the new Team Arrow established, and Felicity becoming a wild card, it feels at least the series is working toward a showdown between Ollie and his nemesis, which will do wonders to recapture momentum and make it easier to glaze over the plot potholes on the way to the season finale.